The DS335 is a simple, low-cost, 3 MHz function generator designed for general benchtop or ATE applications. 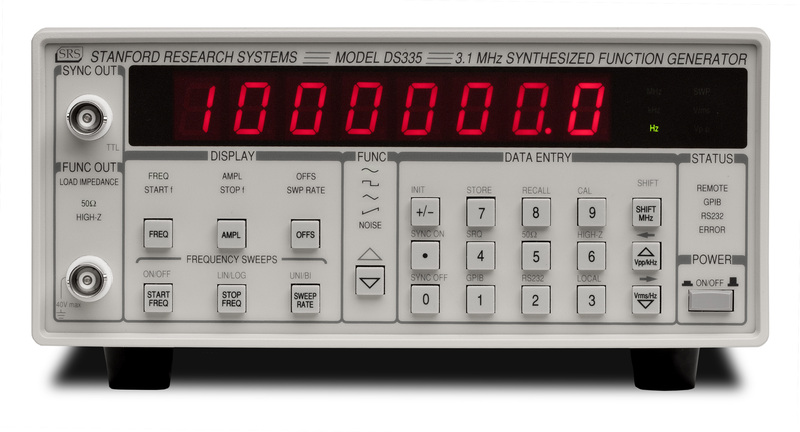 Based on a Direct Digital Synthesis (DDS) architecture, the DS335 includes features not normally found in function generators in this price range. Basic functions include sine waves and square waves up to 3.1 MHz, and ramps and triangles (up to 10 kHz). A 3.5 MHz Gaussian white-noise generator is also provided. All functions can be swept logarithmically or linearly in a phase-continuous fashion over the entire frequency range. A rear-panel SWEEP output marks the beginning of a sweep to allow synchronization of external devices. Both unidirectional and bidirectional sweeps can be selected. Internal and external FSK modes allow the output frequency to be rapidly toggled between two preset values. Toggling is done either at a fixed, internal rate of up to 50 kHz, or externally via a rear-panel input. Outputs have the low phase noise inherent to DDS. Wide-band amplifiers maintain good pulse response and provide low distortion. The result is an output capable of driving 10 Vpp into a 50 Ω load, or 20 Vpp into a high-impedance load. 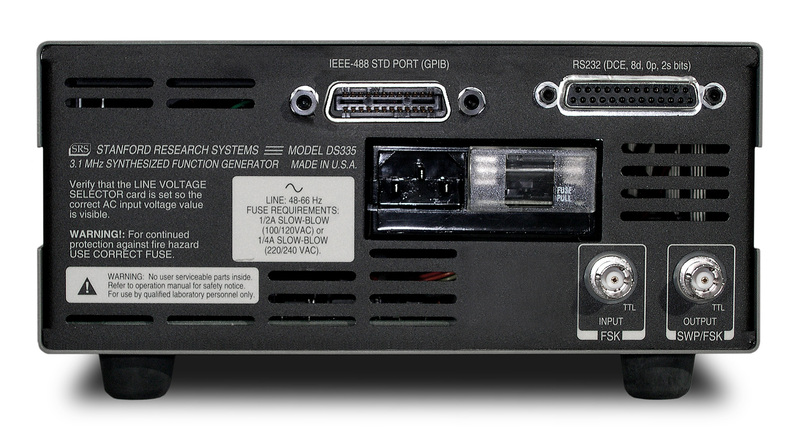 Both GPIB and RS-232 interfaces are available to provide complete control via an external computer. All instrument functions can be set and read via the computer interfaces. Interfaces Optional RS-232 and GPIB. All instrument functions are controllable over the interfaces. Non-volatile memory Up to nine sets of instrument settings may be stored and recalled.